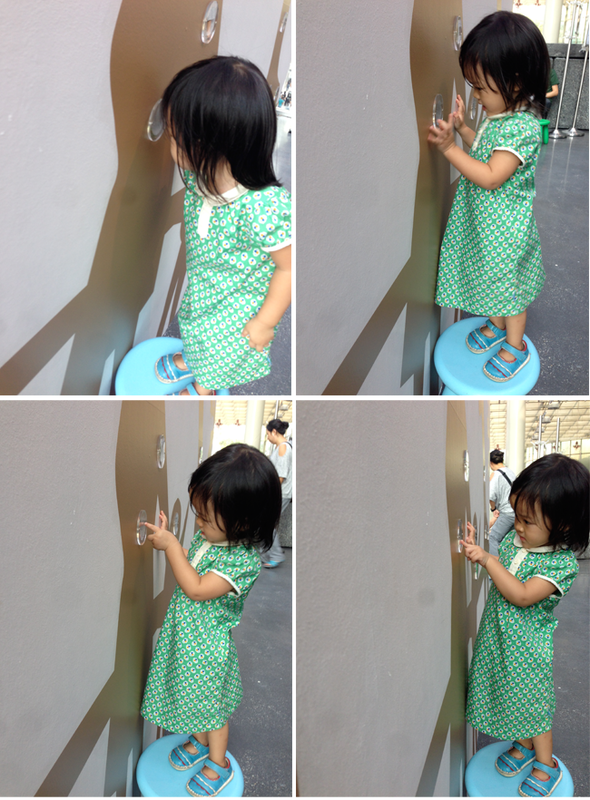 The Children's Season is back for another year and this time round, we decided to visit the National Museum of Singapore. 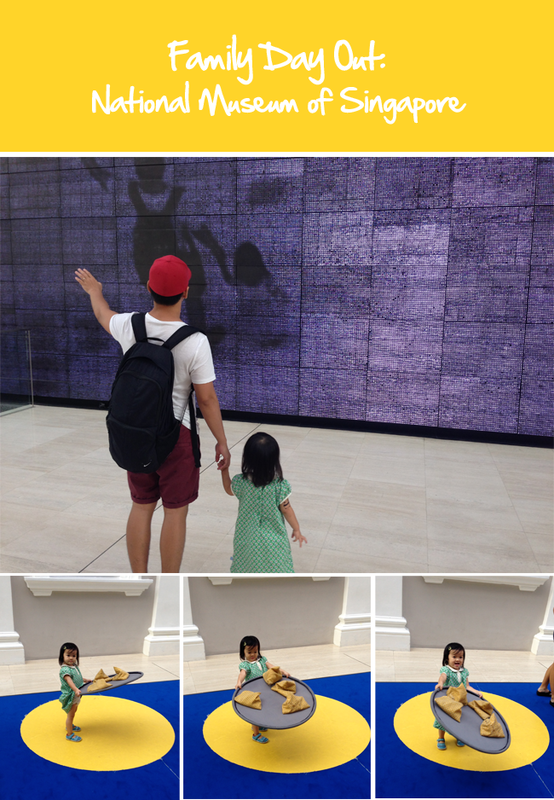 Last year, we brought Kaitlin to the Singapore Art Museum and she enjoyed herself and seemed pretty interested at some of the installations and exhibits so off we went to NMS! I had wanted to bring babygirl on a day when we had the entire day free, but seeing that class was cancelled and Kaitlin was pretty down that Sunday, I made a spontaneous decision to bring her there that afternoon and I'm glad we went instead of doing our usual activities. From now till 3rd August, the special exhibition at NMS titled Masak Masak centres around the theme of My Childhood. Just outside the museum there are bouncy playgrounds that resemble the iconic Elephant and Dragon playgrounds in Singapore. I was excited for Kaitlin to try it out but as babygirl was about to climb up she got startled when she saw kids charging up the bouncy playgrounds. Well, as you can imagine she freaked out and didn't want to play :( Perhaps there may be a next time and she would be more brave to try it out. Off we went inside to seek shelter and enjoy the AC! 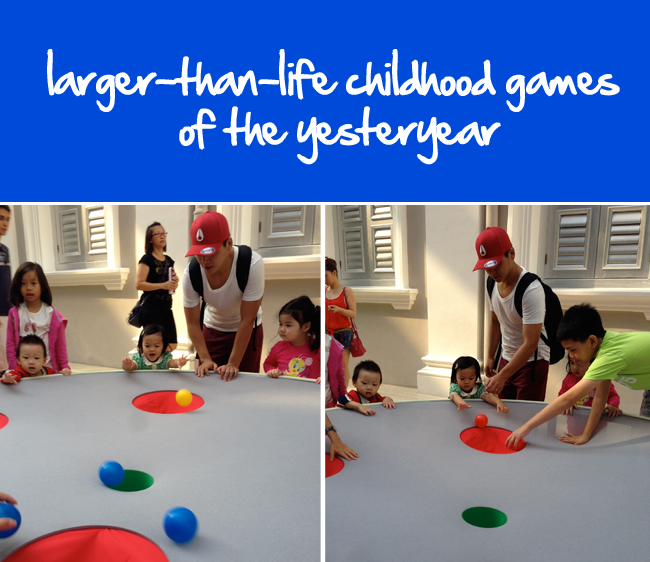 Located at level one, we saw some of our childhood games in a life-sized scale. This included marbles, pick-up sticks and five stones! As you can see from the images at the start of this post and below, Kaitlin really enjoyed playing five stones with Daddy Li! We went up to level two and Kaitlin was very intrigued by the Rouleaux exhibit - a collection of miniature dioramas. If you can't tell, these miniature dioramas were made out of toilet rolls. Pretty cool if you ask me! I've great respect for the artist cos they are so intricate and I'm sure it took quite some time to create these awesome dioramas. We also checked out the Sculpture Scribble. These installations are made from old and scrap materials that demonstrate the law of physics. For this exhibit, do note that you've to queue up and you are given a period of time to explore the different installations. To be honest, we didn't find this exhibit that fun so if you are short on time, i would say give this one a miss and head up to level 3 for PLAY@NMS! 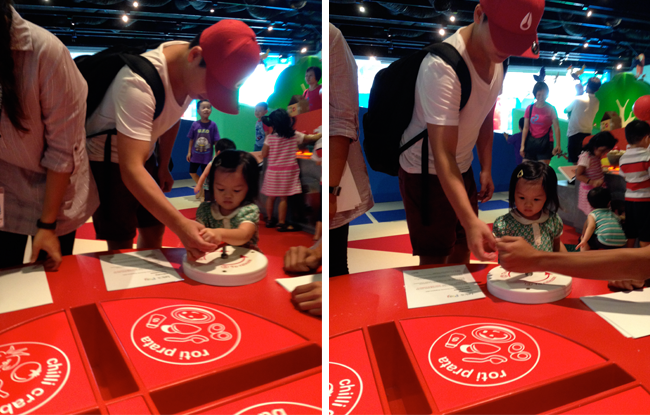 PLAY@NMS recently opened in May and it is the first dedicated area in a Singapore museum for young children! I personally think it's great that they have an area just for kids as I definitely do want to get Kaitlin interested in arts and to enjoy visiting museums. 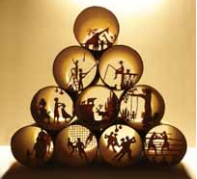 There are three main areas - Explore, Create and Perform. At the Explore area, we went to the living room section and played with mini puppets. 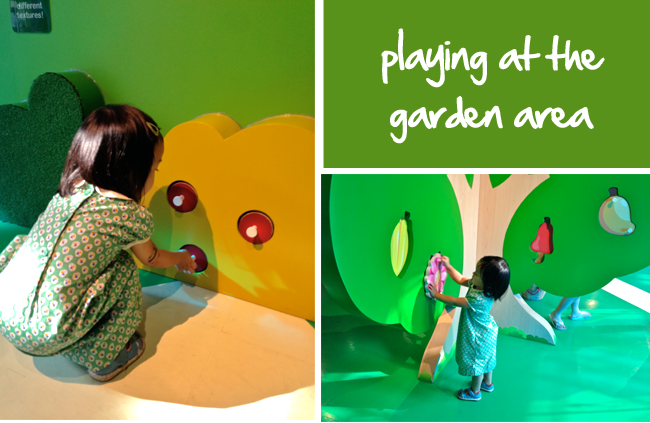 Kaitlin enjoyed playing at the garden where she got to fit in fruit and flower pieces. It was a great opportunity to go through the different fruits with her and a do a quick and fun revision on colours. 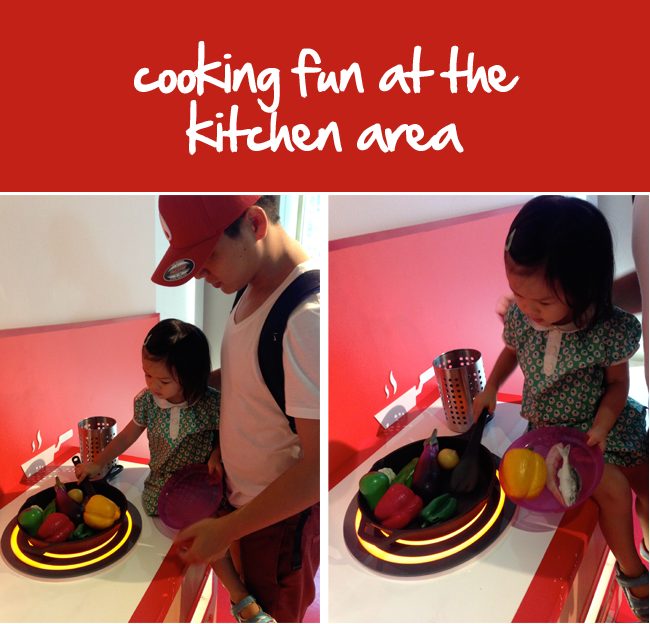 Kaitlin also had fun at the kitchen area where she engaged in pretend play with Daddy Li and cooked me a meal. We also matched images of different ingredients to their names. There was an area where kids could choose their favourite dish and emboss the image on paper which they could colour after. Though Kaitlin hasn't tried many local dishes, we asked her choose one and she chose roti prata! Kaitlin had a great time embossing the image with the help of a staff and Daddy Li and had even more fun colouring afterwards that she insisted on keeping her artwork! As we didn't have much time left before the museum closed, we skipped the Create area and went to the Perform area where they had an exhibit titled Drawings of Sounds. Kaitlin had the chance to 'draw' on a canvas using a flashlight that served as a paintbrush. As it was dark, I wasn't able to take pictures but I do recommend checking this exhibit out. 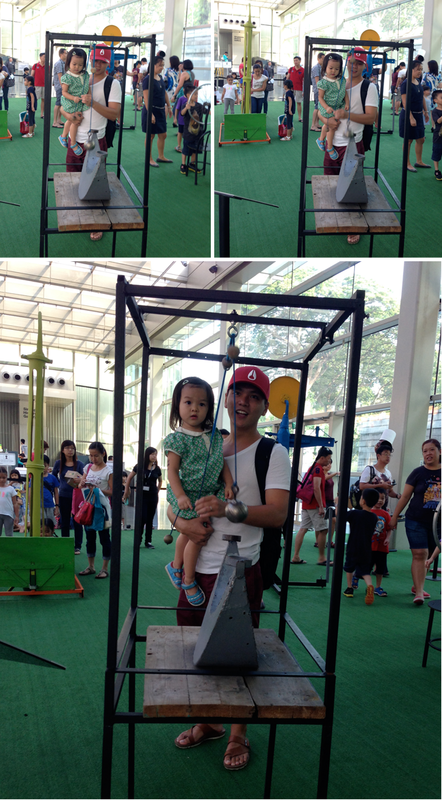 It was pretty fun and definitely something different and interesting for the kids. Even though we didn't finish exploring, we had a really fun time at the National Museum of Singapore and Kaitlin even said that she wants to go back again so perhaps we will make a return visit! It was an exciting and enriching experience for us so I do strongly recommend checking both Masak Masak (on till 3rd August) and PLAY@NMS out. It's free and the kids will definitely have a few hours of fun. So why not head down to the National Museum with your family this weekend? 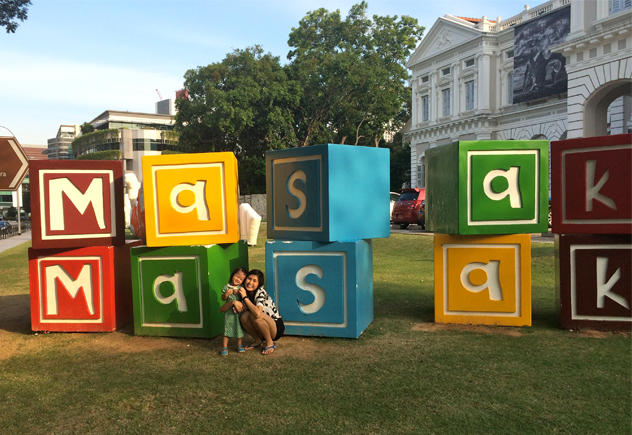 National Museum of Singapore is one of our favourite Singapore Attraction!